Usually in December I get my wife some shiny adornment for her hand, neck or ears. This year I was the one who added a shiny new accessory. 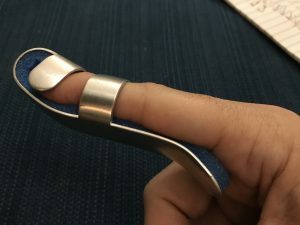 The finger splint you see above that I started wearing after I snapped the extensor tendon in my right index finger. This isn’t something I recommend under any circumstances but especially not when the windchill is about to plummet to negative numbers and the splint, besides getting very cold, prevents one from wearing gloves. But being an optimist, I look on the bright side. I had to slow down. I was forced to rethink how I did just about everything. I’m right-hand dominant to an extreme. The only thing my left hand is good for is to keep my watch from slipping off my wrist. So I really had to think through just about everything I do. Hold a pen, type, eat, wash, all simple stuff until you try to do these things either one-handed or with a hand that’s not used to doing them. And I really had to consider what I was doing and only do that which is really important. 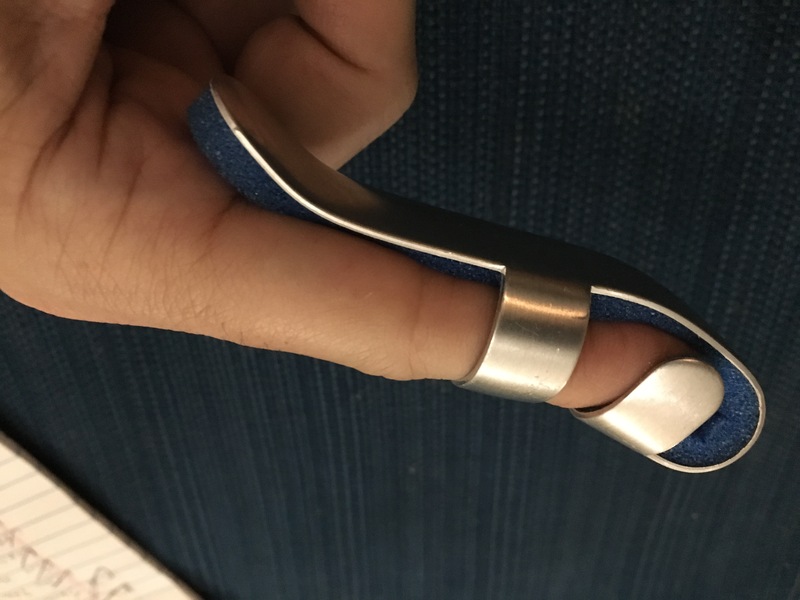 I’m going to be in some kind of splint for about two months at least, and that’s assuming this heals and doesn’t require surgery. It’s sometimes frustrating to not be able to do everything I want, but it’s also freeing. I’ve been doing more reading. I’ve thought more about some things I want to write and while typing is difficult, dictating is not. Technology can be a blessing in a situation like this. There’s all kinds of workarounds in life, sometimes we just need our bodies to remind us to look for them. Focus on what’s really important and take care of yourself in 2018. You never know when something’s about to snap. This entry was posted in Uncategorized by Ron Katz. Bookmark the permalink. Thank you, Ron. Great reminder not to take so many things for granted; also a reminder to think about how to do things in a new and maybe better way. Sorry that you had to experience the pain, but thanks for letting us learn this without having to snap a tendon of our own.